This is a sponsored post in conjunction with Minted.com. Although this post is sponsored all the opinions are my own. I only promote product I believe in! Hello! Thank you for stopping by today. I could not wait to share this beautiful piece of art I received from Minted. 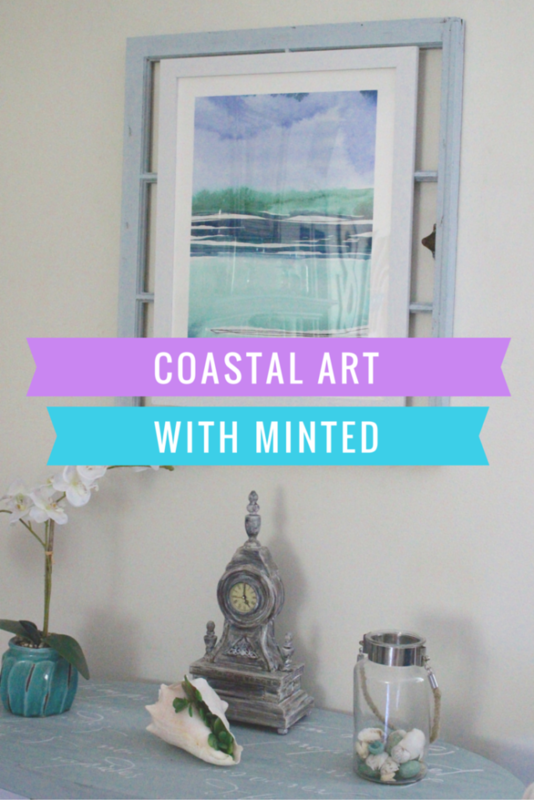 If you are not familiar with Minted, you are in for a treat! Minted is an online marketplace connecting you with independent designers from all over the world. They carry holiday cards, wedding invitations, framed art, party décor, and other personal stationery. They are currently offering free shipping on fine art orders with promo code SHIPFREE. You will definitely want to take advantage of this great promotion! I have been looking for a piece of art to go in my living room for some time, but nothing felt quite right. Most of my art from my old house was a completely different style and color scheme than I have now, think burgundys and hunter greens. My tastes have changed over the years and moving to the Townhouse was the perfect time for me to introduce new colors and styles into our home. I have slowly switched over to more neutral shades with pops of blue. It has a much more Coastal feel, especially in the Summer when I bring out my favorite seashells and Seahorses! 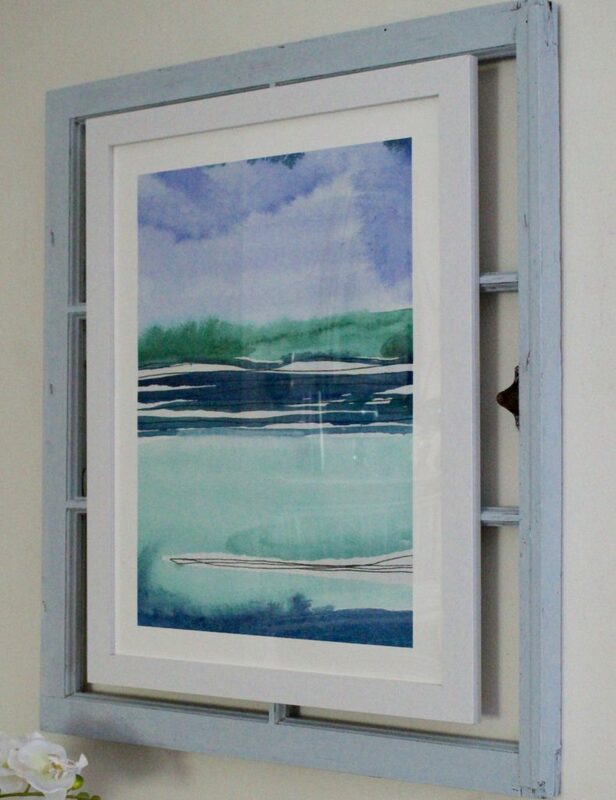 The selection of art from Minted is just incredible and I was immediately drawn to this gorgeous piece called Out To Sea II by Chelsey Scott. It is such a soothing piece and I knew it would be perfect in my living room. This is the fabric for my living room curtains. 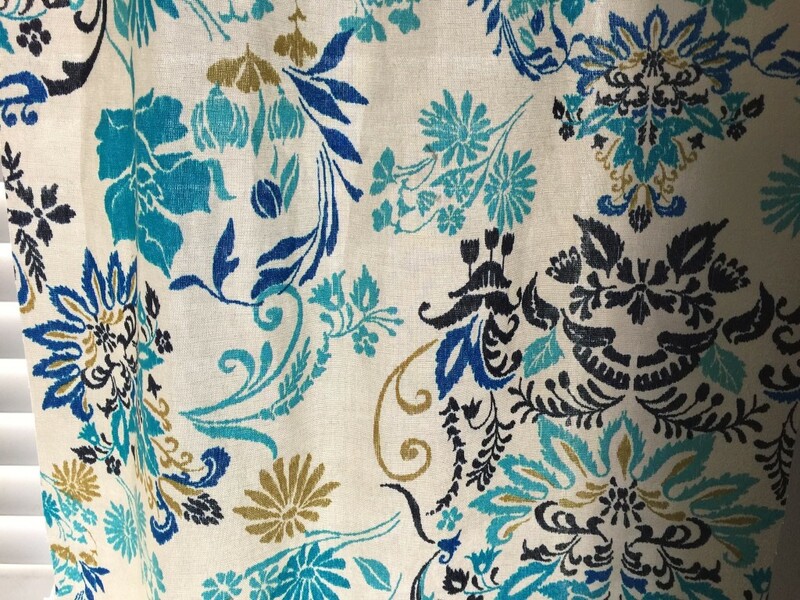 As you can see, the colors in this stunning piece of art flow beautifully with the colors in these curtains. I originally had planned on hanging the piece alone, however, as this is such a large space, I really wanted to step it up a notch and give the art the attention it deserves. The addition of the window behind it gives it extra dimension and also adds color so it doesn’t get lost on the light walls. 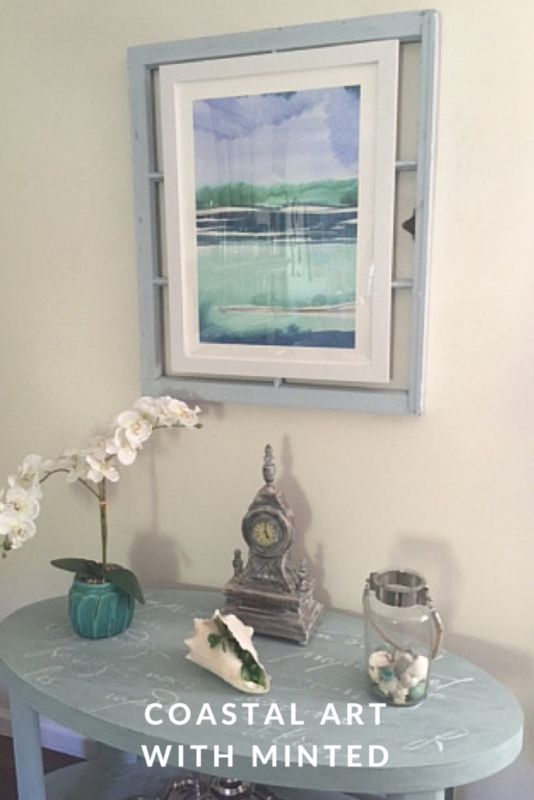 I gave this old window a coat of paint in a soft blue color and it really makes the art stand out! The entire collaboration with Minted was such a pleasant experience. My niece is getting married next year and is ordering her Save the Date cards from Minted! I couldn’t be happier with this piece. It really completes this space and gives it the look I was going for. I know I will enjoy it for years to come! It looks beautiful, and love the idea of using an old window to hang it. That way it has more personality! Thanks Pili! It is such a beautiful print. The colors are so serene. I’m really happy with it! I LOVE Minted! Their prints are stunning, beautifully done and the framing is impeccable. Thank you! I am so in love with it-I can’t stop staring at it 🙂 I love the look of it on the old window! This print is so pretty!! And I love it on the window! Thanks Meg! I love the colors in this beautiful print! Have a great day! This is so pretty, the soft colors are gorgeous! I love that frame too. I love this, gorgeous colors and gives a feeling of calm. That is exactly how I felt when I saw the print-very calming. Have a great day! 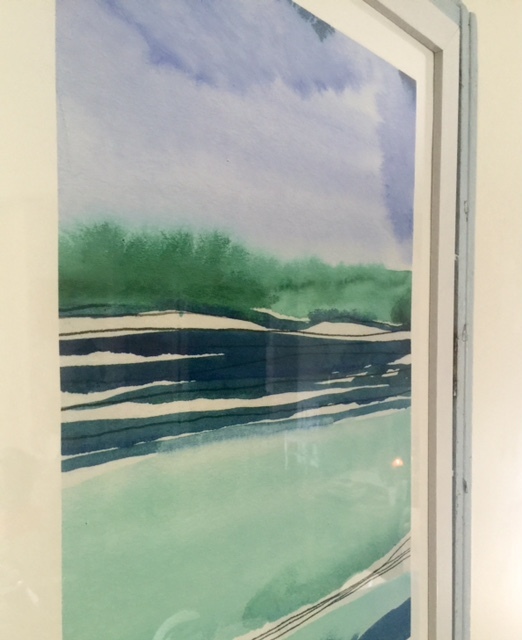 Wow an amazing water color, congrats with working with minted, they have beautiful stuff. I have shop there in the past! The water color looks perfect in your home. Such a gorgeous piece of art! Love the watercolor look. What a gorgeous piece of art — love it! Thanks for sharing at Merry Monday! This is very pretty. I like what you did to add some more flair to the place. Michelle, I love how you used the window to accent it! Thank you for sharing @Vintage Charm! Cecilia MyThriftStoreAddiction recently posted…Broken Chair to Garden Sign: Good Day Sunshine! I hung the picture first and the wall was just too large so it got lost. As soon as I hung it on the window & really popped. It’s such a pretty print that I wanted it to really be a focal point. They have the prettiest prints! Thank you for sharing at Home Sweet Home! Thanks to you that now I know what to do with my old window bar. It’ll be a great work to do. The print content goes well with the color of the bar after all which reminds me of the peaceful. Thanks.